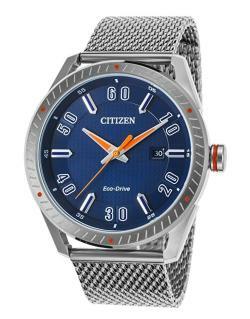 This Citizen Eco-Drive CTO watch is 42mm diameter, and just 10mm thick. It features a stainless steel case, silvertone Milanese mesh baraclet and and ocean blue dial with orange and silver accents. I’m a fan of Citizen watches, and own several. I feel as though they offer good value for the money. They look really good, and have a bit of name cachet, without costing an arm and a leg.